@Jeffo, I know you didn't build this specifically for Wake Garage, but I promise you Wake Garage was made to showcase projects like this! Love the out of box thinking. I'm a big believer in Fresh Air Exhaust (good company and product) and you now have benefits of a few functions in one. @Jeffo -- Thanks for the comments! I posted a polishing link in Shop Talk forum (below). Lots of techniques out there but I swear the zephyr system is great. I learned a lot from that wedge project, but I think I could have started with a better metal finish. Or at least got the flat pieces to a better point before welding.... would have been easier. You get what you pay for in terms of finish but you probably know a lot more about metal than me. That wedge took a lot of sanding until the actual polishing began. It did come out great though. One of my favorite projects for sure, especially because everyone said you can't put a wedge on an '87. That is awesome Jeffo! Great work. It's actually simpler than your other one which makes it an even better design in my book. Who needs a brake, that looks great. That might be difficult to make for my power wedge though. Why do you think your regular changed? Did you have the same wing plate shape before? Thanks for posting, Chris. That's a sweet boat. The attention to detail is second to none with sub box etching, button, bezel etc. It's really multiple good projects within one large install that myself and others can use as a great example. It's got me spinning with ideas! Thanks again. Any changes you'd make if you did it again? My 8.1 needs an FAE this summer. I miss having it from last boat. I'm gonna modify my swim deck first though. As part of the rebuild of the 1987 Sunsetter, we rebuilt and redesigned the interior. One of the projects within this rebuild was the dash, and I've seen many questions about replacing the dash in this era of boats so I wrote up this project to show you one option. The dash on these boats was essentially a large vinyl sticker over gelcoat with tournament water ski time guides printed on it, and featured a 80s grid pattern. You can't buy this vinyl sticker anymore as a replacement. I actually really liked the dash and thought about re-creating the vinyl with my own custom tweaks to keep the boat closer to stock. It's a classic ski boat and I wasn't trying to completely change it. But some of the switches and gauges were also having issues so I ended up making an entire new dash w/rocker switches and white face gauges, which I bought as a set on Ebay. I really wanted vinyl and was able to get some extra black vinyl from Malibu when they helped with my new interior. The goal was to make it more modern but to look like it could have come stock on this boat. I started with a blank aluminum sheet, and cut down the basic shape. The challenge was bending the sides to match the contours of the fiberglass, because they had about a 1"rounded turn in them and had to fit. I could not find a way to achieve this in my garage. So I took the aluminum piece, with measurements and examples of the bend I needed, to a machine shop and they handled it no problem. Worth it. From there I just needed to plan my gauges, switches and layout, and start cutting holes. I used poster board as a template for this step. Once the holes were cut out I heated the vinyl, and stretched it over the dash adhesive until it fit like a glove, and then installed the gauges. All in all, I was thrilled with the results and it really added to the overall redesign/rebuild! 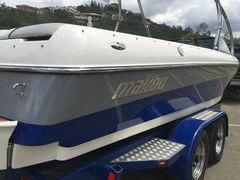 Rebuilt and Modernized This 1987 Malibu Sunsetter boat has been covered in other project categories as well. The entire boat was reconstructed, updated and modernized -- all of which started after rotten floors and stringers were discovered. This project just focuses on the stringers, transom and floor. A decision had to be made once I discovered the stringers were bad. I discovered wood rot in the stringers when I went to tighten a motor mount bolt, which screwed directly into the stringer, and just simply spun around without any grip. From there I pulled up soft spots in the floor and continued searching for bad, rotten wood. I found an awful lot. These boats were ticking time bombs because they were simply resin over wood, very little fiberglass over wood floors, and then screwed and stapled together, which allowed water to penetrate the wood for over 20 years in this case. Malibu, and most others, did not start using composite (waterproof) stringers and floors until the early 1990s. The Sunsetter is a phenominal boat that does everything well, and really helped Malibu get off the ground. 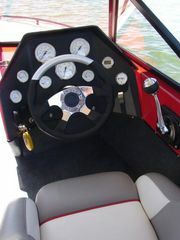 It was the first open bow Sunsetter and is a blast to drive on the open water. But the cost to have a fiberglass shop gut and rebuild the boat exceeded the boats value -- so most boats like this get pushed to the side and left in a scrap yard somewhere. That was simply not an option because we loved this boat. We got to work and did the large majority of the work so that we could keep the boat, and improve it at the same time. Phase 1: Removed the seats and strip the hull of all accessories During this phase I found the seats were also made of wood, and also had rot. They ended up getting rebuilt too, as outlined in the Wake Garage interior project (found here). Phase 2: Removed the floor, the floor stringers and flotation foam I used a skill saw and sawzall primarly to remove the floor and outer stringers. It was an awful lot of work to say the least. I also found loads of water sitting beneath the floor thanks to voids in the floatation foam. 20 years of slow leaks created a mess. The outer stringers are primarily for floor support, unlike the center which provide primary hull integrity and the drivetrain stabilization. Phase 3: Removed the engine and transmission The motor and transmission were unbolted and removed from the boat. The driveshaft, which was new, was left as it lay. From here all the extra floor and floor stringers and tabs were cut or ground out using hand tools and sanded. This was messy and required air respirator filters. Phase 4: Removed the structural stringers Once you remove the main hull stringers you need to ensure the boat doesn't move or be removed from its trailer. The gel coat will crack as the hull will flex too much without the stringers present. Even the dash, which was also held up by wood sides, had to be supported before we cut away the wood siding so it didn't fall and crack from the lack of support. For this we used a 2x4 tower and strapped the dash to it so that it could hang without cracking. Phase 5: Stringers and Transom Rebuilt / Modernized We rebuilt the transom to be stronger and thicker to one day support a wedge. The transom was again used out of wood and shaped based on the old transom's template, but was "doubled" in thickness. The structural stringers were also made from wood for its strength, and shaped to match the previous stringers exactly. Both were wrapped and tied together with vinyl ester resin and heavy biaxial fiberglass materials. Essentially we created a strong bond like a knuckle. The strength from the new build far exceeded the original specs. It was bomb proofed. Additionally, a bulk head was added across the back, tying in the stringers and floor joist/stringers to totally seal the foam under the floor area once the floors were attached. You can see my finger at the transom... notice how thick the material is and how the biaxial tape/glass connects the stringers to transom. Even the floor joists were double layered for waterproofing and strength (ballast was gonna be added too). 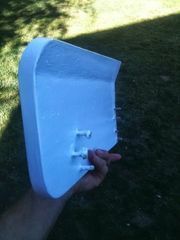 I had Kevin McCarty (McCarty Marine) help with the fiberglassing expertise. The final piece was the gelcoat, which was also added to the stringers and bilge. Everthing went smooth from this place forward. Phase 6: Rebuilt the Floors using composite material and "plexus" epoxy The floors were made from the same materials current Malibu boats use, "Space Age Materials" which is marketing mumbo jumbo for composite. This stuff is 100% waterproof, strong and lightweight. Instead of unprotected screws and staples from the original build, this time the floors were attached using plexus epoxy for a permanent bond without leaving holes in the floor. Phase 7: Floatation Foam was Added The foam was poured through holes in the floor and then sealed when it was done expanding. This flotation foam sits between the floors and the bottom of the hull, this time completely filling all voids underneath. Phase 8: The motor and transmission was reinstalled on the new stringers and re-alligned. This time no bolt penetrated the double wrapped fiberglass wood, without being sealed in epoxy. Phase 9: Reinstall new carpet and interior (See interior project) Phase 10: Complete assembly and enjoy a brand new boat All in all, the boat came out even better than we'd hoped it would. We wet sanded the gelcoat (another project here) and added new decals to tie in the shiny new hull and modern structure underneath. This was a large project but we love the results, and thankfully the boat went to MartinArcher who added surf gate, a Titan III tower and more! Beautiful boat and I miss it for sure. I just broke this project up into multiple parts. I remember how hard it was to find examples of specific parts of the project so hopefully Wake Garage's database with sections will be more helpful to those just looking at specific areas of restoration. That is sweet! I loved the concept when I saw Centurion's announcement. Unfortunately for me I have Malibu's power wedge to deal with... I do like using the wedge and it's adjustments, but it'd be awful hard to create exhaust like this with the wedge. Nice job on both projects, Jeffo! Was the rooster tail the only disadvantage to the FAE style pipe? The plate is cooler for sure, but just curious. The cool thing is the old Illusion is getting retrofitted (narrowed) for an older Malibu. So it's getting new life and will make the next boat look great too. Hoping he will post that project here too. Looks like you had a manual ghetto gate, err, "slapper" at one time (sitting on platform in picture). Post some wake pics when you can! Awesome project. You could probably charge some of us for your relay/timer recipe... its very clean and looks like it works well. I'm a huge fan of Wake Logic but you came up with a very effective alternative. Impressive. You'll probably get hit with more questions about it come summer. Nice project and thanks for sharing it! Had a catastrophic failure of the bearings on one hub of my 2007 Extreme trailer. These were "oil bath" hubs, which use oil instead of grease and have a sight glass on the end. My dilemma was to fix/replace the one wheel or update all the hubs to a newer style (or conventional grease). Here's what I found: 1) Grease hubs (i.e. "buddy bearing" or caps) PROS: proven with proper maintenance, can run temporarily even if grease is low. CONS: buddy bearings caps will pop off with excessive heat, such as braking on hills. Too much grease also causes over pressurization. More frequent maintenance. 2) Oil Bath hubs PROS: gear oil runs cooler than grease. Relatively low maintenance CONS: Once they leak, if not caught quickly, will lead to catastrophic failure quickly. Slow, undetected leaks also cause water to displace the oil 3) UFP Vault hubs PROS: Uses a hybrid grease/oil, which acts like grease at cooler temperatures and heats to an oil which keeps the bearings at lower temperature, sealed system that are maintenance free, 5 or 10 year warranty. CONS: Difficult to service, more likely to replace. Still more likely to fail with a leak. After talking with multiple trailer shops about reliability, and also hearing UFP's pitch, I chose to replace my oil bath hubs with Vault style hubs. Unfortunately the spindles are different vs an oil bath so they also needed to be replaced. I found the best deal was to buy the kits, at roughly $200 a piece, which included everything: trailing arm, spindle, bearings, hub, rotors, calipers and pads. This means with 2 bolts you can replace everything, without rebuilding or replacing a portion of the setup. Purchasing 4 kits basically gave me a new trailer from the frame down, with the latest and greatest. Swapping the kits are easy. 1) Mark the axle The trailing arm / spindle fits over the axle and determines the trailer ride height. Before you remove the spindle, it's best to mark the position of the old trailing arm to keep the same height, or understand it's reference. I used a black sharpie, marking where the split is relative to the axle, and then used a chisel with a hammer to make permanent mark. You can also count the number of teeth down from the top center of the axle. 2) Remove the old spindle. Remove the spindle bolt with a 15/16" wrench and socket/breaker bar. Then you'll need to split the trailing arm bite with a wedge or chisel to open it up. A hammer and chisel is the fastest way vs prying it off. Rust typically develops on the axle forming a tight bond. Once you "open" it up it will be much easier to pull off. You'll also need to remove the brake line from the old caliper. Some trailers have just one line to the caliper, and others use a daisy chain. 3) Clean the axle Usually there's a fair amount of rust on the axle from years of dunking the trailer in water. It's best to quickly clean the axle with a wire brush, throw some WD40 and perhaps a little grease over the axle prior to putting on the new spindle. 4) Install new trailing arm kit Line up the split in the trailing arm with the indicator mark you made earlier, and then gently press it on until it slides evenly. You can use a rubber mallet to tap it on further as needed. The axle has a cutout in it for the bolt, so you'll need to push the assembly on far enough for the bolt to slide down evenly. Reassemble the bolt (torque appropriately) and then re-attach the brake line to the new caliper. 5) Bleed the brakes Bleed your new brakes, starting from furthest wheel out from the master cylinder to the closest wheel. Replace your wheels and check your height. Your trailer should be sitting at the same height as before but your can of course make adjustments as needed. Check the hubs for heat as you use the new trailer. Stop often and place your hand on the hub and check. Enjoy the new hubs. This method worked well for me. The Swap In this project I replaced the stock Illusion (first generation) wakeboard tower from my 2007 247 boat with a G3.2 that was made for a 2016 Malibu VLX. Both beams are 102” but the top of the gunwales have a different shape and the project took a lot of modification. I liked the Illusion tower and think it’s one of the best looking ones out there with it’s curved arches. But I love the height and strength of the G3, I’ve been a big fan since it first appeared in 2010. For me it combined the good looks of the forward swoop "Illusion" tower with the rigidness of the Titan towers. G3s are less accessible and very expensive. I bit the bullet when my dealer had an “extra” tower after someone did not want one on their boat. This particular tower was from a 2016 Malibu VLX, and the tower was the 3.2 version with the all black upgrade and grey anodized Malibu combo racks. Swapping towers was not as easy as I thought! Removing Illusion Removing the Illusion tower started with simply removing the bimini and wakeboard racks first, to take weight off the tower. The speakers were then removed one at a time, and required cutting wires or un-splicing them. The wires were labeled prior to removal as well, so the next owner of the Illusion tower could make an easier transition. 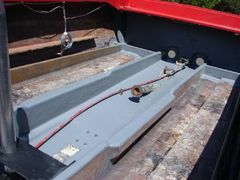 Once the tower was stripped of accessories, the next step was to remove the Illusion’s hardware underneath the gunwale. Access to the hardware and mounting bolts was limited without removing the interior panels on each side. There were nine or small bolts running through from the interior panel into the gunwale, each with a brass locking nut that had to be removed. This part sucked because it was hard to reach them all with a 7/16 ratchet wrench. There’s usually an easier way, but I’m not one for patience and I seem to get bloody knuckles on all my projects anyway. At this point I could peel the interior panel down far enough, although I later removed three more lag bolts on the bottom to completely remove the panels (and cup holders, speakers, etc that were attached). The Illusion uses a small cable that attaches on one end to a large spring that’s clipped to the mounting bracket beneath the gunwale. The cable runs around a pulley and up through the base of the tower to an eyelet on the tower itself. This allows the Illusion to fold down with weight assistance of the spring (adjustable with a tensioner). This cable needed to be removed first, carefully, in a position the that provides the least amount of tension possible. Once the cable/spring was removed from the bottom rear point of the tower, I was able to remove the allen bolt holding the front pivot point of the Illusion tower to the tower base. You will need assistance because once you remove both sides the tower top is free and you don’t want to scratch up the boat. Now the easy part, there were three 1/2” bolts that attached the tower legs to the gunwale. The bolts came right out. Once you remove the legs you’ll see two more allen head tapered bolts on the gunwale that basically hold the bottom bracket up. I removed the allen bolts and the bottom mounting bracket came right out smoothly. Measuring for the G3 Now that the Illusion tower was off, I hoped the bolts of the new tower would line up, but they were not even close. The G3.2 mounts also have three holes, but they are spaced more evenly with each other, front, middle, rear. Instead of bolt heads, the new tower has 1/2” stainless studs, that screw into the base from the bottom via an allen head. 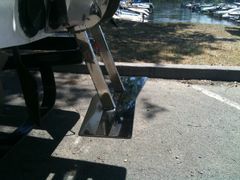 Then you secure it with a brass locking nut and washer, with the an included aluminum bracket between the nut and hull. I added lock tight prior to final installation. First step was to tape off the gunwale with masking tape so that we could mark the holes and to prevent scratching it when lining it up. It’s good to measure multiple times to ensure the tower folds down where you want it to, typically, behind the windshield to create a lower profile in the stowed position. I ended up mounting the new tower approximately 5” back from where the Illusion mounted in order to clear the window from. The G3 is taller and the pivot point different. I then temporarily mounted the G3 with just the center stud bolt with one new hole drilled, to make sure it fit and folded prior to drilling the others. From there I marked the two additional holes based on the bracket with the predrilled holes. You can see in the picture how the holes were totally different in alignment. The tower was moved further than the bracket in picture. Once the holes were drilled, they were chamfered to prevent gel coat cracking later under stress. The bit I had was a little too small for 1/2" hole, but I made it work. Gelcoat Repair Once the tower fit, I was ready to fix the hull before final installation. Since the tower was moved back 5” and the mounting points were different, drilling new holes next to the previous made swiss cheese of the gunwale. Additionally the front two holes were now exposed and would not be hidden by the G3 mount. First step was to fill the holes in to strengthen the gunwale again. I used chopped fiberglass with epoxy resin to fill in the holes (because I had some), and then used 3M patch filler and sanded the top deck in preparation for gelcoat. For the gel, I used Spectrum’s color matched gelcoat from iBoats.com. I’m no gelcoat expert but I’ve done the basics many times before. My preference was to keep the filled-in holes just slightly lower than the surface, rather than make it perfectly flat and add on top with gel coat. I think this is against what I’ve read. If the gel is too thick you run the risk of cracking, but I think a little on the hole top makes it blend better and is more forgiving with sanding. I mixed up the gelcoat according to instructions. I then diluted with styrene at 10%. Taped off the gunwale and sprayed using the cheap little preval sprayer. I did two coats, the first just on the holes, then sanded, and then a second over the section that was taped off. I probably went thicker than I needed to, but that just meant more sanding and it was a little area. You’ll use lots of masking/painters tape for both the sanding and the spraying. The key is to create the hot zone where you will sand and spray, and then as you wet sand it move the tape out in small increments to make the zone a little bigger each time. I started with 400, then made the zone 1/2 bigger, then went to 600, made it bigger again, etc. This way you’ve feathered it all the way to 2000. I used a sanding block for every step. Next step was to polish it to a shiny finish. I used Maguire’s 105 to start it off, and then switched to 3M’s Finesse it, with a rotary polisher and a wool cut pad. I waxed it and it looked as good as new. It almost has to be shiny before you can tell if there are any indentations. I did make a mistake on one side that requires another pass. I sanded a little too deep and a dark spot appeared from the red gel coat that is layered under the white. I was pretty pissed at myself because it was a careless mistake from rushing the job. So I will have to go back and fix it. Oops! Before mounting the tower, you’ll also want to chamfer the new holes as best you can. My chamfer bit was on the small side for 1/2” holes, so I ended up using a much larger bit and spun it in reverse to get the same effect. Chamfering helps minimize gelcoat cracking, which is especially important with tight fitting bolts. Installing the G3 tower The correct way to lift and lower the G3 tower would be using a hoist in a shop. That being said, I used my teenagers to hold up each leg and we walked it forward. My ten year old helped line up the holes before lowering the tower. Not the best way, but it worked without a scratch. The other option is to screw the studs up from underneath the gunwale into the tower, then put the bottom bracket and then the lock nuts. I found that even though I measured many times, I still ended up needing to drill slightly larger holes to ensure a fit that wasn’t forced. Once again, having those interior panels removed all the way will make installation much easier. Done! Overall I am stoked to have it finished. It took me over a week of on-off work. I’m sure others would be faster but it was worth the investment to me once it finally “fit”. We also purchased the 2016 bimini with surf straps and that was a breeze to install. Took over a month for Malibu to build and send it but the bimini matched perfectly. The new tower lined up, not 100% perfectly but nothing on a fiberglass boat is ever absolutely perfect, no matter how much it costs! I’m stoked about the project, and think the boat looks like it came with it. The only downside so far is that it pushed me to spend more money on a windshield tint, which I think tied the all-black G3 in even better with my color scheme. I didn't use to be a fan of tinting, until I test drove a boat that had it, and loved the clarity inside). I also picked up some used Rev10s that came from another G3, because I sold all the speakers from the Illusion. Was going to wait until winter (because all of this was expensive for me), but I just couldn’t pass up the Revs. Here's my recipe list: 1/2” drill bit and drill Masking tape Spectrum Gelcoat Preval sprayer 3M Vinylester Patch putty Fiberglass resin Wetsand paper (400, 600, 800, 1000, 1500, 2000) Rotary buffer and cutting pad 3/4” Wrench Allen Wrench Locktite Accessory wire Patience!!! Thanks. Got a few mods in the works... But the manual SG mod definitely was worth a few hours of time. Saved me from having to throw down so much weight right out of the gate for sure. I have the materials for powered gates, just need the time. Been really happy with a basic setup but I still hate trying to fight the steering with a manual gate, especially to pull around and pick up goofy riders. Make sure to edit in any updates to your SG project, and let me know if I can help! Spending over 80 hrs on prepping the hull and tiny details like adding motor decals... wow. Nice work. That's impressive. Love the silver metallic tower matching the new decals too. That's a sweet looking boat. If you have any more pictures of rebuilding the ballast pumps, please post them in the ballast projects! Haven't seen that done too often but I'll bet you'd save others money. Thanks for sharing! That's about as detail oriented and impressive as I've seen. Congrats. Awesome project, Max 1.6. Thanks for sharing. That's some solid info on the psi force the system generates. I'm thinking about trying this on my Malibu. No doubt to me Nautique's NSS design is clean. Nicely done!